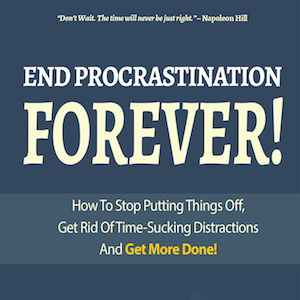 End Procrastination Forever is a book published by Aingeal Rose & Ahonu for these times. They wrote it in response to the growing numbers of requests for advice from students and clients who were battling with this issue. You glance over your phone. Receive alerts and notifications left and right. You look at the time and realize it's 3 in the afternoon and you still haven't gotten any work done! Finally, we've got an episode on how you stop putting things off, get rid of distractions and get more stuff done instead of procrastinating! It's called, "End Procrastination Forever". Listen to it here and get rid of time-sucking distractions! You can also get the book on Amazon here.